La fouille exhaustive du dolmen du Néolithique final de l'Ubac a permis de mettre en évidence plusieurs phases d'occupation se caractérisant par des répartitions différentes des vestiges anthropologiques. L'étude de ces vestiges a révélé une évolution significative d'une phase à l'autre dans la manière de gérer cet espace. Au travers de ces informations, il est possible dans certains cas d'opérer une distinction entre des gestes purement fonctionnels, liés à la gestion des restes humains, et des actions plus complexes signalant une perception et une pratique de la topographie interne de la chambre funéraire dont aucun élément architectural ne rend compte. 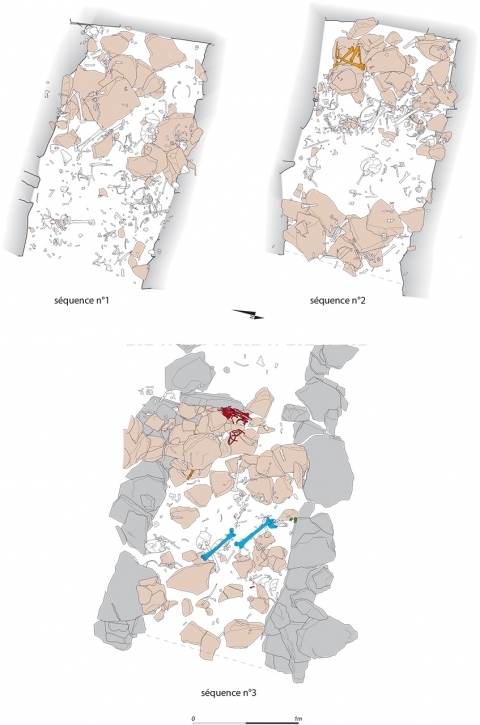 The complete excavation of the Final Neolithic dolmen at Ubac revealed several phases of occupation, characterized by successive distributions of anthropological remains. The study of these remains showed that the way this area was used changed significantly from one phase to another. In certain cases it was possible to differentiate between purely functional decisions related to the handling of human remains and more complex actions that signal awareness and modification of the internal topography of the funeral chamber, modifications that cannot be explained by any architectural element. The Ubac dolmen in Goult was discovered in the alluvial plain of the Calavon river. In 1994, a rise in the river’s water level revealed this funerary monument and swept the eastern portion of it away. The site was then fully excavated. 2The monument is composed of an earthen mound, 14 m in diameter, surrounded by two concentric arrangements of vertically placed stones. Its surface is protected by a layer of small pieces of molasse. The funeral chamber at the center of the monument is 2.40 m long, 1.40 m wide, and 1.30 m tall. It is composed of stone walls, a paved floor, and a door to the west composed of two vertical stones and a high doorstep. Opposite the door, to the east, is a chevet composed of one large stone and stone sidewalls. The whole monument was originally covered with three stones, two of which were later displaced to each side of the door. 3The monument was well protected by regular sediment deposits, aiding the conservation and the interpretation of the funerary practice organization. At least 40 individuals were entombed. Adults of both sexes and juveniles are represented, though no infants younger than one year of age were found. Of the four phases of occupancy, only the first three will be discussed here. The final phase represents a sepulchre that was established after the funeral chamber was completely filled with sediment. 4The first phase of burials is dated between 3286-2904 BCE1. This phase can be divided into several sequences during which 18 individuals were buried, 13 of which were more than 13 years of age. In the first sequence the bodies were positioned at more or less the center of the funeral chamber, and dismantled skeletons were left in the same area. Next, several bodies were placed to the west, near the entrance, and a collection of bones were arranging in a pile in the eastern half of the chamber. This pile was modified several times, and it has a certain order: the smallest bones are found at the bottom, more voluminous bones are in the middle, and the sacral and hip bones are at the top, with several of them being aligned. Human remains that cluttered the space between the complete bodies and the pile of bones were cleared out regularly. Right against the chevet is a small space that contains practically no bones. The limit of this virtually boneless sector coincides with the alignment of the pelvic bones at the top of the bone pile. At the end of this funeral cycle, new bodies were placed near the entrance. Bones were dispersed on a considerable part of the surface, and a few stones cover the ensemble. Only the small space to the east contains no remains. 5The second phase, dated at 2930-2703 BCE2, was installed perhaps after an interruption of the occupancy. Several stones slabs placed to the east of the chamber constitute a new floor. Seventeen individuals (of which 12 are over 16 years old) were placed in the chamber during this phase. The vast majority of them were placed in the eastern half of the sepulchre. Three successive sequences were determined. The first sequence is the best preserved, and presents a very precise organization. The youngest juveniles are concentrated in the south, while the adults are in the opposite side and to the east, where at least two of the deceased were placed in succession. Disconnected bones were accumulated between the adult and juvenile groups. This subdivision of space is not delimited by any physical object. Nevertheless, the division is maintained throughout this phase of occupancy, even if during the following two sequences the skeletons are more thoroughly dismantled. 6The third phase of occupation, dated at 2888-2707 BCE3, shows continuity with the previous phase. The funeral chamber is heavily damaged. A part of the south wall collapsed, and the slabs that served as the roof were displaced. Numerous stone blocks accumulated in the interior of the chamber, a result of the collapse and human activity. Nevertheless, the funerary occupation continues. Ten individuals, of which eight are older than 16 years old, were deposited in various states of decomposition. After the cadavers decomposed, large amounts of bones were removed, in particular the larger ones. After an initial sequence where bones and stones were placed in no apparent order, a central area was cleared of all obstructions. Three skulls were placed at the center of this area. Two others were placed against the southern wall. These are the only cranio-facial remains found during this phase. After some time the central space was refilled with blocks of stone and bones, as was the rest of the sepulchre. 7To interpret these archeological findings, it seemed interesting to start with the definitions of bone arrangement and transportation that were clearly established and explained by Philippe Chambon (Chambon 2008). The Ubac sepulchre was never fully saturated with bones. During the first two phases of occupation, there is no lack of space: bones occupy only half of the chamber surface at any given time. Yet the spatial distribution of the remains changes significantly between the first and second phases of occupation. 8During the first phase, after the center of the chamber was initially used for the deposition and processing of corpses, functional divisions appear. The bodies are left near the entrance, and bones are accumulated on the opposite side of the room. We think this is a functional division of space, though the role of the small, unused space at the east side of the room is unknown. The continual non-use of this space cannot be explained by any environmental factor. At the moment we have no way of explaining this phenomenon. 9The management of space during the second phase seems strikingly different. Most anthropological remains are concentrated in the eastern half of the room, and the juveniles and displaced bones occupy a very specific area to the south. This rigorous organization, which is most obvious in the first sequence, seems to be functional in nature above all. From this perspective the grouping of juveniles in a specific area could indicate a will to preserve their remains, a practice that is observed in certain mass graves resulting from catastrophic events (Rigeade 2006: 156). Only the stone floor installed near the chevet seems to have been a favored spot to deposit deceased adults during the first sequence. Afterwards, the thorough dismantlement of the skeletons during the following two sequences shows that little of the initial organization was preserved, except for a concentration of bones in the eastern half of the chamber. This eastern concentration of bones seems crucial, and is present during the entirety of this phase. While the eastern half of the chamber is reserved entirely to accommodate the deceased and their remains, it is more difficult to determine the function of the western half. No evidence (e.g. furniture, architecture) indicates that it had a particular role, other than serving as the entrance to the tomb. 10In the chaos of skeletal remains and stones during the third phase, the clearing of the central area is a decisive act, the only gesture that gives a certain logic to this funerary occupation, whose organization we struggle to understand. The placement of three skulls at the center of this small surface and the positioning of two others nearby gives it a particular role, of which the symbolic significance can be clearly envisioned considering the specific treatment that cranial remains often receive. 11In the end, the archeological arguments that we have employed offer a poor vision of the funeral chamber practices of Neolithic humans, 90% of the studies objects having been moved from their original position. The little related anthropological evidence that remains, such as the large spatial divisions that persist despite perpetual reorganizations, shows, in our opinion, that the users of the tomb transmitted a subjective topography for many generations. 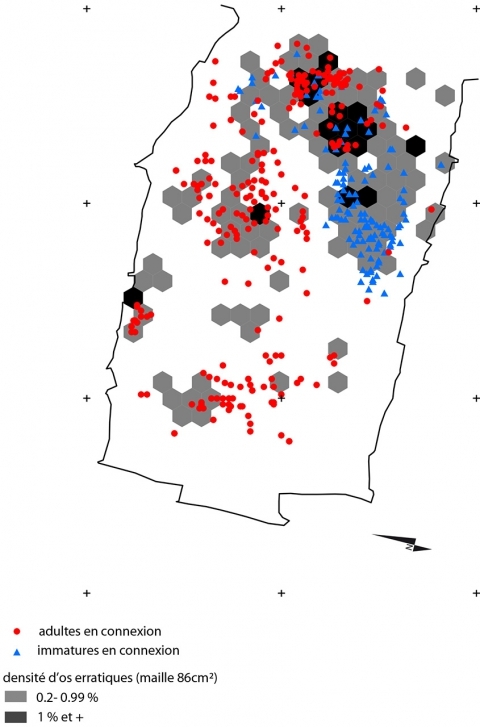 This continuity of spatial distribution of human remains shows that the funeral chamber is not simply a corpse receptacle for the communities that used them. 12Le dolmen de l'Ubac, a été implanté au pied d'un relief molassique fermant la plaine alluviale de Marican, non loin de la rive gauche du Calavon, cours d'eau s'écoulant au pied du versant nord du massif du Lubéron. Le monument a été découvert en 1994 à l'occasion d'une crue sapant les berges et dégageant une coupe de 80 m de long laissant apparaître la section de la chambre funéraire et du tertre. Une fouille programmée dirigée par G. Sauzade entre 1996 et 2001 (Sauzade et al. 2003) a permis l'étude exhaustive de la chambre funéraire ainsi que du tertre. Ce monument est le second du genre découvert dans le Vaucluse. Le premier, le dolmen de la Pichoune à Ménerbes, implanté en pied de massif, à 3 km du site nous intéressant ici (Sauzade 1983), présente une architecture tout à fait comparable. Il a été totalement vidé de son contenu dans les années 1860. 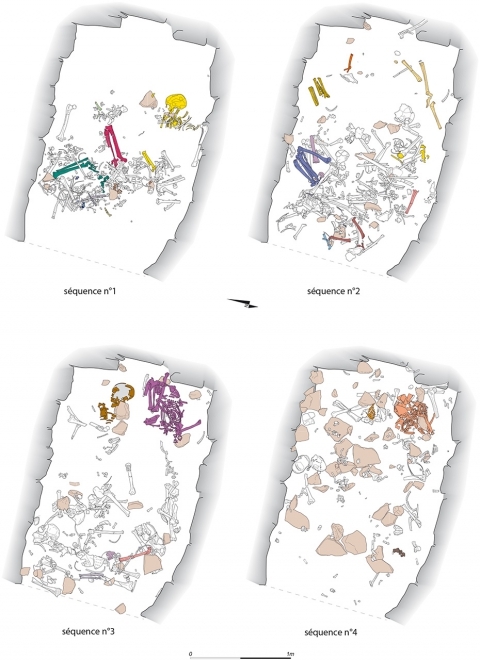 13L'excellent état de conservation des vestiges de l'Ubac est pour partie dû à des apports sédimentaires récurrents fossilisant l'architecture et les restes anthropologiques. Quatre phases d'occupation ont pu être distinguées à partir de critères portant aussi bien sur l'évolution de l'architecture de la chambre que sur la présence d'aménagements spécifiques ou encore, la répartition des squelettes ou segments de squelettes en connexion. Chacune de ces phases se subdivise en trois à quatre séquences correspondant à différents stades d'occupation et d'exhaussement du sol matérialisés essentiellement par la présence de vestiges anthropologiques en connexion. 14La fossilisation récurrente d'ensembles anthropologiques offre l'opportunité de saisir quelques processus de dislocation et de déplacement des restes humains restés inachevés. Ces éléments permettent d'approcher la manière dont l'espace de la chambre a été utilisé au cours de ces différentes périodes d'occupation. Pour ce faire, l'analyse des témoignages archéologiques s'est efforcée de prendre en compte l'ensemble des vestiges anthropologiques dans une démarche croisant l'archéothanatologie (Duday 2006) et différents critères tels que chronologie, densité, catégories d'os, maturation, etc. Les hypothèses qui en découlent ont été testées à l'aide d'un Système d'Information Géographique et traduites graphiquement. Il a ainsi été possible de mettre en évidence des topographies bien différenciées d'une phase à l'autre. Toutefois, essentiellement fondée sur des critères d'agencement et de répartition spatiale des vestiges anthropologiques, les aménagements et artefacts étant très rares et peu caractéristiques dans cette sépulture, la perception de l'organisation de l'espace d'inhumation se heurte à de nombreuses difficultés au premier rang desquelles figure la distinction entre des gestes ou pratiques répondant aux contraintes fonctionnelles de la sépulture et d'autres pouvant avoir une origine culturelle. Dans la perspective de différencier au mieux ces deux aspects, il sera tenté, après avoir brièvement présenté le contexte archéologique et les restitutions possibles du fonctionnement de la chambre funéraire, de discuter des motivations culturelles ou fonctionnelles à l'origine des répartitions spatiales constatées. 15Le monument funéraire de l'Ubac présente les caractéristiques habituelles des dolmens à chambres allongées de Provence. Construit exclusivement en dalles de molasse tertiaire issues des effondrements de pied de pente tout proches, il est composé d'un tertre de 14 m de diamètre ceinturé d'une double rangée de grosses dalles fichées dans le sol (fig. 1). Le remblai argilo-limoneux composant le monticule est protégé par une cuirasse de dalles déposées en surface. En son centre, la chambre funéraire d'environ 2,40 m de long pour 1,40 m de large et 1,30 m de hauteur, est dotée au nord-ouest d'une porte ouvrant sur un couloir très court. La construction a pris place dans une fosse d'une quarantaine de centimètres de profondeur. Les parois longitudinales sont constituées de parements de dalles de molasse dont les assises supérieures ont été montées avec un léger encorbellement interne. L'ouvrage est simplement armé de quelques dalles en boutisse ancrées dans le remblai du tertre, sans doute apporté au fur et à mesure de la construction. La porte comporte deux piédroits monolithes encadrant un seuil de 40 cm de haut constitué d'une dalle verticale. À l'opposé, à l'est, le chevet, retrouvé effondré au pied du monument, est composé d'une grosse dalle complétée de parements aux angles et au sommet. Le sol de la chambre est recouvert d'un pavement de dalles de petit module. La couverture met pour sa part en œuvre trois grosses dalles qui étaient à l'origine jointives ; deux d'entre elles ont été dans un second temps déplacées de part et d'autre de la porte, la troisième, à l'est, a chuté en contrebas lors de la crue de 1994. Enfin, la porte, murée sur la moitié de sa hauteur, débouche sur un couloir 1,50 m de long à peine plus étroit que la chambre. Ce dernier est délimité par deux parements aux assises régulières au contact des piédroits de la porte qui se prolongent ensuite par des parois de facture grossière, sensiblement évasées vers le haut et construites en appui sur le remblai du tertre. L'accès est comblé par un conglomérat de sédiment argileux et de pierres identique au remblai constituant le tertre. 16Ce monument funéraire a pris place dans un complexe d'apports sédimentaires plus ou moins grossiers dont le plus ancien, à la base de la coupe étudiée, a été daté de la fin du Mésolithique grâce à des charbons de bois. La fosse accueillant la chambre a été excavée dans un dépôt d'alluvions riches en sables ocreux présentant des vestiges diffus d'occupation du Néolithique moyen. Ceux-ci sont caractérisés par quelques éléments lithiques et céramiques ainsi que par un foyer dont les charbons ont été datés entre 4236 et 3848 BC4. La construction de la sépulture a également porté atteinte à un dépôt de mobilier homogène composé de trois écuelles carénées et de deux stèles brisées. La majorité de ce mobilier est localisée à l'ouest de la sépulture, entre les deux péristalithes et un peu à l'extérieur de celles-ci. Quelques tessons se rapportant aux vases constituant ce dépôt ont également été retrouvés dans le remblai du tertre. La similitude de cet ensemble mobilier avec les vases et stèles composant les dépôts de fondation des sépultures du Néolithique récent de Château Blanc à Ventabren (Bouches-du-Rhône ; Hasler et al. 2002) invite à proposer que ce lot de mobilier participe d'un contexte funéraire dont tout autre vestige aurait disparu. 17Outre le remblai apporté pour constituer le tertre, la stratigraphie se rapportant à la sépulture mégalithique se compose essentiellement, à l'extérieur du monument, d'apports sédimentaires comportant quelques témoignages anthropiques — foyer et éclats de taille — datés de l'âge du Bronze ancien. 18Dans la chambre funéraire, malgré la disparition du tiers oriental de la sépulture et l'effondrement du chevet en contrebas de la coupe, l'absence de toute perturbation ou arrachement constatée sur les vestiges les plus proches de la coupe conduisent à considérer que la perte de matière à ce niveau est très réduite. Lors de l'utilisation de la sépulture, les apports sédimentaires à l'intérieur de la structure ont été encore plus importants qu'à l'extérieur. C'est ainsi que, lors de la mise en place des derniers défunts, la chambre était comblée jusqu'à son sommet. Ces dépôts récurrents d'un limon de même nature, issu pour une bonne part du remblai du tertre, ont contribué à fossiliser une partie des squelettes et segments anatomiques isolés à des stades divers de démembrement et dispersion. Nous traiterons ici des trois premières phases d'occupation funéraire se déroulant à l'intérieur de la chambre funéraire. La dernière phase correspond à une sépulture prenant place au-dessus des piédroits de la chambre funéraire après que celle-ci ait été complètement comblée. 19D'un point de vue chronologique, des datations radiocarbone ont été effectuées sur des échantillons d'os humain se rapportant sans ambiguïté à la première séquence de chacune des phases. Les fourchettes dans lesquelles s'inscrivent les dates calibrées les plus probables de cette série de quatre datations absolues5 se chevauchent en tout ou partie. Après traitement statistique (Bronk Ramsey 2009), il apparaît que le chevauchement des intervalles les plus probables des deux premières phases est extrêmement réduit (fig. 2), avec une forte probabilité pour que les premiers défunts aient été mis en place à l'orée du troisième millénaire (3286-2904 BC à 95.4%) et que la seconde occupation de la chambre s'inscrive dans les deux siècles suivants (2930-2703 BC à 95.4%). Il est difficile cependant de déterminer à partir de ces seules dates si la sépulture a véritablement cessé de fonctionner entre ces deux phases. La troisième phase est également dans une fourchette d'un peu moins de deux siècles (2888-2707 BC à 95.4%) recouvrant parfaitement la précédente et suggérant une probable continuité dans l'occupation funéraire, les différents niveaux archéologiques n'ayant pas été perturbés. Il en va de même de la dernière occupation, la phase 4 (2876-2632 BC à 95.4%). 20Au moins 42 individus ont été inhumés dans cette sépulture. Les deux sexes figurent à parts quasiment égales et les immatures de plus de deux ans ne présentent pas de déficit notoire. En revanche, les 0-1 an ne sont représentés que par un seul sujet. Ce déficit apparaît significatif au regard de l'effectif attendu dans le cadre d'une mortalité archaïque. Ces caractéristiques démographiques ne varient pas significativement d'une phase à l'autre. 21La première phase d'occupation funéraire prend place sur le sol dallé du caveau. Le matériel anthropologique repose en majorité à l'horizontale, il se rapporte à un nombre minimum de 18 individus dont 13 de plus de 13 ans6. Les éléments en connexion ont permis de distinguer quatre niveaux de dépôt successifs ou séquences signalant autant d'exhaussements du sol (fig. 3), la composition du sédiment ne variant pas. 22Dans la première séquence d'occupation, la plupart des vestiges sont réunis en un amas allongé proche de la partie centrale de la chambre. Ils se composent d'os erratiques, ne présentant aucune cohérence anatomique les uns par rapport aux autres, et de neuf segments anatomiques en connexion (membre inférieur, jambe et pied, avant-bras). La disposition de ces segments montre que la majorité d'entre eux a été déplacée au même titre que les os isolés ; seul un ensemble pourrait se rapporter à un dépôt primaire, il s'agit d'un pied gauche d'adulte demeuré dans le prolongement de la jambe à proximité duquel reposent le premier métatarsien et le pouce du pied droit en connexion (fig. 3-1 en vert). Ajoutée à ces vestiges anthropologiques, la concentration dans le quart sud-est de la chambre de sept perles en roche, les seuls éléments de parure découverts dans la tombe, ainsi que de trois pointes de flèches laissent supposer que quelques défunts ont été initialement placés dans cette partie de la chambre. À l'ouest, à l'extérieur de l'amas d'os, le buste d'un enfant de 6-9 ans placé sur le flanc droit témoigne d'un dépôt primaire en grande partie démantelé (fig. 3-1 en jaune). Le reste du squelette, notamment les vestiges des os coxaux et membres inférieurs, est dispersé parmi les os en position secondaire. Entre l'amas d'os et les restes en connexion de l'immature, une surface d'une trentaine de centimètres de large ne présente aucun vestige. 23Au cours de la seconde séquence, l'amas osseux en partie est de la chambre s'élargit. La moitié occidentale en revanche reste quasiment exempte de vestiges. La plupart des ensembles anatomiques qu'il a été possible de relever apparaissent déplacés. Aucun dépôt primaire n'a pu être mis en évidence. Le processus d'accumulation dans la moitié orientale de la chambre se poursuit également au cours de la troisième séquence. Les os sont cette fois réunis en plusieurs petits amas. On distingue aussi un cordon d'os coxaux et sacrums disposés parallèlement au chevet et à une trentaine de centimètres de celui-ci. Dans la moitié ouest en revanche, près de la porte, subsiste le buste d'un adulte placé en décubitus (fig. 3-3 en brun) ainsi que le squelette partiellement disloqué d'un autre adulte de sexe indéterminé (fig. 3-3 en violet), en position latérale contractée, dont le crâne a disparu. Entre ces corps et l'amas d'os, le matériel anthropologique est rare et diffus. 24Cette première phase d'occupation s'achève sur une quatrième séquence marquée par le dépôt à proximité de la porte d'un adulte dont seul le buste est conservé. Une seconde inhumation primaire est suggérée par la présence d'un pied gauche d'adulte parfaitement conservé. Outre ces défunts, des os erratiques et des segments anatomiques en position secondaire parsèment la surface de la chambre. Ils voisinent un nombre important de dalles de moyen calibre introduites volontairement dans la chambre, peut-être dans l'intention de sceller la couche funéraire. 25Il importe enfin de signaler que cette phase présente un déficit notoire de blocs crânio-faciaux. Quatre seulement ont été dénombrés dont deux en position secondaire au sommet. Une recherche plus précise sur cette question a permis de démontrer que les dents et alvéoles pluriradiculées maxillaires sont sous représentées, en revanche les dents monoradiculées maxillaires sont aussi bien représentées que les mandibulaires, laissant supposer le prélèvement de crânes probablement à l'état sec. 26La vision dynamique de l'évolution du contexte funéraire que procure cette mise en séquence permet de proposer que les premiers corps ont été déposés dans la partie centrale de la chambre. Leurs restes ont été dispersés sur place et cet endroit est ensuite devenu le siège d'une accumulation d'ossements isolés. Les défunts ont après cela été placés en moitié ouest de la chambre. Cette pratique s'est poursuivie au cours des trois séquences suivantes. Par ailleurs, séquences 1 à 3, une zone quasiment exempte de vestiges sépare les dépôts primaires de l'amas d'os. 27L'ordre dans lequel les os constituant l'amas ont été empilés suggère que celui-ci a rapidement pris une certaine hauteur. On peut en effet percevoir une distribution verticale par volume ou catégorie. Les plus petites pièces sont à la base, les gros os longs en position intermédiaire et les éléments du bassin au sommet. Cette disposition laisse supposer que cet amas a été constitué très tôt puis augmenté et modifié au fur et à mesure de l'exhaussement du sol. En séquences 2 et 3, des éléments constituant le tas ont ainsi été dispersés et deux ou trois nouveaux regroupements d'os de moindre importance ajoutés à la marge. En dépit de ces perturbations, passé le premier temps d'utilisation de la tombe, la répartition des vestiges anthropologiques esquisse une division fonctionnelle de l'espace : les défunts sont placés dans la moitié occidentale de la chambre, non loin de l'entrée et, après démembrement, à différents stades de décomposition des corps, leurs restes sont accumulés dans la moitié opposée ; un espace central régulièrement débarrassé de tout ossement sépare ces deux emplacements. 28Cette distribution spatiale est nettement exprimée par les densités de vestiges anthropologiques de chacune des trois aires en question. L'amas d'ossements et la zone de dépôts primaires présentent la plus forte concentration (densités respectives : 680 et 360 objets/m²) tandis que la surface s'intercalant entre ces deux secteurs a livré peu de vestiges (densité : 280 objets/m²). La densité apparaît encore moindre dans une étroite bande parallèle au chevet (densité : 186 objets/m²). On soulignera que cet abaissement brutal de la densité d'ossements à l'est coïncide avec l'alignement d'os du bassin signalé plus haut. Ces éléments convergent vers la matérialisation d'une limite à cet endroit dont il reste difficile de connaître l'origine et la nature : simple artifice lié à la répétition de gestes ou véritable structure ? Les données archéologiques ne permettent pas de restituer à l'emplacement de la limite supposée une quelconque architecture, pérenne ou périssable. La disposition des os relevés au contact de l'amas et de cette petite aire de 0,40 m² environ ne signale aucun effet de paroi et l'empilement des vestiges présente une verticalité très relative. Ces arguments étant épuisés, il ne subsiste donc que le constat d'une faible densité d'ossements à cet endroit. Une densité tout aussi faible de matériel ayant été constatée à l'ouest de l'amas d'ossements, on pourrait envisager que ces deux secteurs sont le fruit de la répétition de mêmes gestes de déblaiement et empilement. Cette interprétation paraît pourtant peu satisfaisante si l'on considère que, lors de la quatrième séquence d'occupation, au cours de laquelle l'amas d'ossements n'est plus perceptible, la petite surface en question demeure exempte à la fois de vestiges anthropologiques et de dalles, pourtant nombreuses par ailleurs. 29La seconde phase d'occupation de la chambre funéraire (fig. 4) débute par la mise en place d'un pavement composé de trois grosses dalles alignées contre le chevet complété par un ensemble de plus petites dalles plus ou moins jointives ; l'ensemble couvre un peu moins de 1 m². Le reste de la surface est parsemé de dalles de tailles diverses disposées sans ordre apparent, se chevauchant parfois, et laissant d'importantes lacunes entre-elles. 30Au cours de cette phase, au moins 17 individus, dont 12 de plus de 16 ans, ont été introduits dans le caveau à des stades de décomposition plus ou moins avancés. La position de squelettes complets ou partiellement conservés et de segments anatomiques déplacés permet de restituer trois séquences d'occupation. 31Lors de la première d'entre-elles, immédiatement sur les dalles placées à l'est, un adulte a été disposé en position contractée, le dos parallèle à la dalle de chevet (fig. 4-1 en brun). Ce sujet n'est pas le premier défunt placé à cet endroit, sous ses restes sont en effet apparus les phalanges et métacarpiens en connexion partielle d'un précédent individu. Deux autres adultes ont été disposés tête bêche à proximité et perpendiculairement à la paroi nord de la chambre : une femme adulte dont il ne subsiste que les membres inférieurs et le bassin (fig. 4-1 en vert foncé) et un homme disposé en position ventrale contractée (fig. 4-1 en jaune clair). Contre le flanc gauche de ce dernier, une petite dépression oblongue comblée d'un sédiment très meuble dans laquelle a glissé une partie du bassin du sujet en question signale l'arrachement probable d'un bloc fiché dans le sol. À l'opposé, contre la paroi sud, gisent les restes de deux immatures, l'un de 8-10 ans, très perturbé, a été disposé contre le bord du dallage (fig. 4-1 en bleu) ; l'autre, de 5-6 ans, a été placé à proximité, en position contractée, parallèlement à la paroi de la chambre (fig. 4-1 en jaune). Enfin, des os en position secondaire ont été accumulés entre ces immatures et le dernier adulte placé sur le dallage. À l'extrémité opposée, face à l'entrée, reposent le bassin et les membres inférieurs en position contractée d'une femme adulte (fig. 4-1 en vert clair). L'absence des os des extrémités des membres et la disjonction de la plupart des liaisons articulaires laissent supposer que ce bloc anatomique a été déplacé à un stade de décomposition très avancé. 32La seconde séquence d'occupation n'a livré aucun véritable dépôt primaire. En revanche, des os erratiques et segments anatomiques en position secondaire ont été accumulés, essentiellement dans la moitié est de la chambre. L'amas d'os en position secondaire relevé dans la séquence précédente a aussi considérablement augmenté. À proximité, sur le plus jeune immature relevé précédemment, a été déposé un enfant de 8-12 ans dont les restes (fig. 4-2 en vert clair), composés essentiellement des plus grosses pièces osseuses, ne présentent plus de cohérence anatomique, laissant supposer qu'il s'agit d'un dépôt secondaire. Douze autres segments anatomiques dispersés dans la moitié est de la chambre signalent de probables dépôts primaires démembrés et déplacés. 33La troisième séquence d'occupation est composée pour l'essentiel d'os ou de segments anatomiques en position secondaire dispersés en majorité sur la moitié orientale du caveau. En face de l'entrée, repose un adulte probablement de sexe féminin (fig. 4-3 en gris) dont il ne subsiste que le rachis, le membre supérieur gauche, le bassin et les membres inférieurs en position contractée. Ces derniers ont été manipulés à un stade de décomposition avancé. Les faces postérieures des deux ailes iliaques sont en vis à vis et le membre inférieur droit est plaqué contre le flanc gauche du sujet. Pour finir, quelques blocs et dalles ont été introduits dans la chambre et dispersés sans ordre apparent. 34La répartition des vestiges anthropologiques en grandes classes — maturation, dépôts primaires ou secondaires — esquisse une distribution interne prenant place dès la première séquence d'occupation. Les vestiges anthropologiques sont ainsi nettement concentrés en moitié est de la chambre (1184 objets dans la moitié est, 340 à l'ouest). En outre, dans la moitié est de la chambre, quelques constantes apparaissent. Les os des plus jeunes immatures figurent ainsi en plus grand nombre là où les premiers d'entre eux ont été déposés, contre la paroi sud. À proximité, la concentration d'os en position secondaire initiée en première séquence s'est progressivement accrue. Il est également intéressant de souligner que la succession de deux individus adultes au moins sur le dallage bien ajusté disposé au fond de la chambre représente le seul cas pour cette phase d'un renouvellement des dépôts sur un même emplacement préalablement débarrassé des restes du précédent occupant. Outre la particularité du sol à cet endroit, ce geste pourrait souligner l'importance de cet emplacement. À l'opposé, face à l'entrée, le dépôt successif au même endroit, séquences 1 et 3, de deux sujets isolés partiellement conservés suggère également une relative permanence dans l'usage de l'espace. Enfin, à mi-longueur de la chambre, l'arrachement probable d'un bloc au contact duquel aurait été placé l'un des deux sujets adultes disposés contre le parement nord pose également question. N'étant pas en mesure de restituer la hauteur que cet élément pouvait avoir, il est difficile de définir le volume qu'il occupait dans la chambre funéraire. Dans l'hypothèse où son élévation aurait été de quelque importance, on notera simplement que le négatif en signalant la présence s'étend sur moins de la moitié de la largeur de la chambre. Cette emprise limitée laisse supposer qu'il s'agit plutôt d'un simple dispositif de calage lié à la mise en place du sujet adulte contre lequel il se trouvait. 35La troisième phase d'occupation est avant tout marquée par une dégradation importante de la chambre funéraire. Deux dalles de couverture sont déplacées et le sommet du parement condamnant la porte précipité dans la chambre, laissant la structure largement ouverte à l'ouest. Dans le même temps, ou à peu d'intervalle, une partie du mur sud, près du piédroit de la porte, s'effondre et non loin, à l'est, le même parement est spolié de quelques blocs, créant ainsi une petite cavité. Nous ignorons tout des éventuels dispositifs de fermeture de la sépulture ayant pu être mis en œuvre après ces bouleversements ; l'importance des apports sédimentaires ayant alors eu lieu laisse supposer que, à l'inverse des phases précédentes, leur efficience était très limitée. 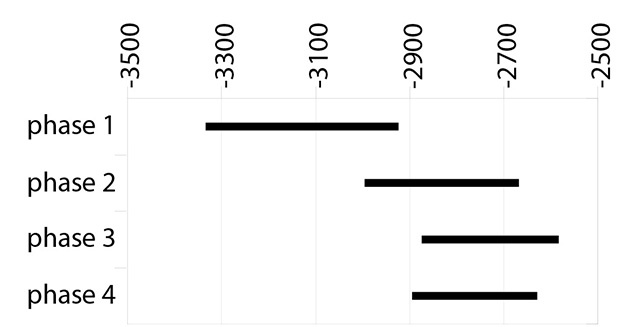 Différents épandages ou amoncellements de blocs et dalles permettent de restituer trois séquences scandant le 0,80 m d'épaisseur de matériaux accumulés au cours de cette phase (fig. 5). Malgré la relative ouverture de l'espace sépulcral, celui-ci continue à recevoir des restes humains, sinon des dépôts primaires, la majorité des assemblages anatomiques relevés ne comportant aucune liaison articulaire. Dix individus dont huit de plus de 16 ans sont ainsi dénombrés. Peu d'éléments permettent alors de préciser quelle a pu être la disposition initiale des défunts ; le profil ostéologique établi pour les adultes suggère l'introduction probable de corps très dégradés, ayant perdu une partie des os des extrémités des membres. Les pièces osseuses les plus volumineuses semblent également avoir fait l'objet d'importants prélèvements. Seule la moitié du thorax et le membre supérieur gauche d'un adulte témoignent de la mise en place très tardive d'un défunt (fig. 5-3 en rouge) contre le piédroit sud de la porte, alors que la chambre était presque totalement comblée. 36Dans cette succession assez chaotique d'événements, d'après la perception archéologique que nous en avons, la disposition des éléments archéologiques de la seconde séquence signale une intervention sur les blocs et ossements visant à dégager un espace central de 0,90 m². Les éléments encombrant le centre ont à cet effet été repoussés sans ménagement et ordre particulier à la marge de la surface en question, créant vers l'ouest notamment un cordon périphérique à plus forte densité d'ossements. Un crâne d'adulte occupe le centre de cet espace. Peu après, au début de la troisième séquence, alors que le sol s'exhausse progressivement, deux nouveaux crânes sont réunis au centre, se superposant au premier, et deux autres sont placés contre la paroi sud, devant une lacune du parement. Ensuite, l'aire dégagée au centre s'encombre de nouveau d'os et de dalles. 37Au travers de ces témoignages archéologiques, le geste de dégager un espace central fait peu de doute. Sa finalité apparente non plus, les crânes s'y trouvant réunis représentant la totalité des vestiges crâniens complets ou sub-complets (cranium ou calvarium) d'adultes que compte cette phase. 38Dans un article récent, Philippe Chambon (Chambon 2008) a clairement démontré que le fait de déplacer des os dans une sépulture collective n'implique pas nécessairement un rangement. Les exemples provençaux cités par l'auteur, mettent en avant le fait que l'un des principaux mobiles de ces mouvements plus ou moins ordonnés d'ossements est bien évidemment la nécessité de gagner de la place dans des espaces sépulcraux le plus souvent très exigus. Il paraît particulièrement opportun de s'inspirer de la démonstration apportée dans cet article pour aborder le cas de la sépulture de l'Ubac. L'espace y est en effet sans doute un peu moins compté que dans la plupart des sépultures du néolithique final en Provence puisque le nombre minimum de 42 individus déposés dans la tombe apparaît sensiblement en dessous de la moyenne7 (n=69) si l'on exclut les sépultures en hypogée dont les effectifs sont nettement plus importants. Malgré cela, le processus dominant dans la sépulture de l'Ubac apparaît bien être le déplacement : sur les 4725 os humains coordonnés dans les trois phases d'occupation nous intéressant ici, seuls 415, soit 9% du total, n'ont pas ou très peu été mobilisés. Ce rapport est souvent encore plus défavorable dans nombre de sépultures collectives où seules quelques jonctions articulaires subsistent. Ceci a pour conséquence de donner un poids considérable dans notre analyse à un fait qui, pour les contemporains de la sépulture, pouvait apparaître secondaire, voire parfois totalement fortuit. Corollaire de ce perpétuel brassage d'ossements, il est bien souvent difficile d'établir si la disposition des vestiges anthropologiques conservés en connexion est véritablement représentative de pratiques funéraires. Seule la récurrence d'une sépulture à l'autre des positions imprimées aux vestiges les plus significatifs nous permet de le supposer. 39Revenant dans un premier temps sur la nécessité de déplacer les restes des précédents occupants en vue de libérer de la place dans la sépulture, la densité d'os humains réunis dans chacune des deux premières phases (fig. 6) montre clairement que les surfaces présentant les plus fortes concentrations d'ossements sont sensiblement inférieures aux espaces libres ou à très faible densité. Jointes à l'impression générale donnée par la succession de plans par séquence, ces valeurs confirment à notre avis la volonté de limiter l'encombrement à la moitié environ de la surface disponible au cours des deux premières phases. Néanmoins, cette répartition spatiale ne s'est pas opérée de même manière dans l'une et l'autre des phases et il ne peut être exclu de ce fait qu'elle ne réponde pas aux mêmes fonctions. 40Au cours de la première phase, les défunts furent d'abord placés en partie centrale, ensuite dans la moitié ouest de la chambre, tandis que les os mobilisés étaient accumulés dans la moitié opposée. Les restes de squelettes conservés en séquences 1, 3 et 4 témoignent clairement d'un démantèlement actif des corps et de la volonté d'accumuler les ossements dans une partie bien précise du caveau où ils ont été parfois rangés par taille ou catégorie. Entre ces deux emplacements, en séquences 1 et 3, une surface intermédiaire apparaît pour sa part régulièrement débarrassée de tout reste humain. La permanence de cette répartition indique-t-elle une division précise et programmée de l'espace ou est-elle seulement le fruit de gestes répétés ? 41Si l'on considère simplement l'aspect matériel que revêt l'introduction d'une vingtaine de cadavres dans un volume d'à peine plus de 3 m3, il est loisible de douter de la nécessité de procéder ainsi. Des sépultures en hypogée, telle celle des Boileau, comptant environ 300 individus empilés sur 12 m² (Devriendt 2004), montrent en effet qu'il est tout à fait possible de placer un nombre important de défunts sans pour autant libérer systématiquement un espace réservé aux dépôts primaires. 42Un autre élément mis en exergue par cette accumulation d'ossements pose question, il s'agit de la petite surface de 0,40 m² à très faible densité de vestiges précédant le chevet. Mise à part l'arrivée tardive de quelques gros os au cours de la séquence 3, ce petit volume est demeuré pratiquement libre tout au long de la phase d'occupation en question. Cette permanence n'a pu être justifiée par la restitution d'une paroi à partir des données archéologiques. Rien ne permet de démontrer qu'un tel aménagement a existé. Des " aires terminales ", bien plus vastes et perceptibles au travers de différents témoins archéologiques, ont été relevées dans quatre des sépultures collectives de Val-de-Reuil et Portejoie en Normandie (Billard et al. 2010: 215), certaines semblent avoir été libérées tardivement des restes des défunts qui y avaient été initialement déposés, ce qui n'est pas le cas ici. En revanche, il a parfois été constaté, comme dans le dolmen catalan des Maioles (Clop Garcia 2004), que la seule accumulation des ossements déplacés est à même de prendre une certaine puissance verticale. Il semble ainsi possible de retenir que la simple répétition de gestes, alliée à quelques rangements, signalés entre autres par le nombre important d'os du bassin au sommet de l'amas et l'alignement de quelques-uns d'entre eux à sa lisière, semble à même de générer et préserver sur le long terme la matérialité d'un tel espace. Ceci n'explique toutefois pas pourquoi cette petite surface est restée exempte d'os et matériaux en séquence 4, au moment où l'accumulation d'ossements n'est plus perceptible. Il y a là à notre avis une réalité se plaçant au-delà du simple artifice fonctionnel qui impose d'envisager une volonté durable de préserver ce petit volume. De telles petites zones vacantes, ou à très faible densité de vestiges, ont aussi été repérées dans la vaste sépulture de la Chaussée-Tirancourt, les auteurs (Leclerc & Masset 2006) n'ont pas non plus trouvé de réponse satisfaisante quant à leur rôle. 43On le constate, l'addition ou confrontation de ces différents indices ne débouche pas sur une reconstitution sans équivoque du fonctionnement de la phase 1. La division fonctionnelle de l'espace sépulcral ne fait pas de doute et demeure l'impression dominante que procure l'examen des données archéologiques. Néanmoins, la gestion d'un nombre aussi réduit de défunts n'impose a priori pas une répartition aussi stricte. Il faut par conséquent retenir que si la spécialisation des espaces répond à une bonne gestion des restes humains telle que nous l'entendrions aujourd'hui, elle n'en est sans doute pas l'unique moteur. La préservation d'un petit volume près du chevet, les indices d'interventions délibérées sur des cadavres partiellement décomposés, le prélèvement des crânes ou encore le rangement par catégories des os imposent d'envisager des pratiques bien plus complexes où la gestion des ossements, sans être négligeable, n'est qu'une composante. 44Pour sa part, la répartition des restes anthropologiques au cours de la seconde phase d'occupation esquisse nettement une bipartition de la chambre. La moitié occidentale de celle-ci recèle peu de vestiges — deux adultes ainsi qu'une réduction —, tandis que la majorité (73%) d'entre eux — squelettes, segments anatomiques en connexion et os déplacés — est concentrée dans la moitié opposée du caveau. Un simple examen des relevés par séquence montre cependant clairement que le fonctionnement de la sépulture est nettement différent de celui de la première phase. 45La spécificité d'un espace occidental, maintenu avec un encombrement limité tout au long de la seconde phase, fait ainsi peu de doute. Dans une approche rationnelle, sa présence se justifie d'autant moins que, dans la moitié opposée, le mode de gestion des cadavres, comprenant démantèlement et accumulation sur place des restes, ne nécessite en effet aucun lieu de dépôt primaire particulier, à l'inverse de ce qui a été envisagé précédemment. Une bipartition de la chambre funéraire a été relevée dans quelques rares dolmens du Var8 où elle est matérialisée par des dalles dressées ; on ne sait cependant comment y étaient répartis les vestiges anthropologiques. Dans le cas de l'Ubac, seul peut-être l'arrachement d'un élément, sans doute une dalle, placée perpendiculairement à la paroi nord pourrait signaler une limite, mais celle-ci fut abolie peu après la décomposition du sujet masculin qui la jouxtait. Et, ne présentant aucune continuité ou symétrique au sud, ce dispositif n'offre rien de commun avec les grandes dalles divisant l'intérieur des chambres sépulcrales varoises. Il ne semble pas non plus possible d'attribuer à cette moitié occidentale le rôle d' "espace liminaire " proposé pour la tombe de la Chaussée-Tirancourt (Leclerc & Masset 2006). Dans la sépulture en question, la matérialité de cet espace est en effet établie par un cordon de pierres et, surtout, sa fonction apparaît justifiée par la présence d'objets spécifiques. Ainsi, sans véritable limite, il est bien difficile de dépasser le constat d'une volonté pérenne de concentrer les défunts dans la moitié orientale de la sépulture et, à défaut d'autres arguments, la partie opposée conserve le simple rôle d'accès. 46À l'intérieur de la petite surface occupant la moitié est de la sépulture, la répartition des défunts par grandes classes de maturation — adultes ou immatures —, fait clairement apparaître des espaces spécifiques : les adultes en connexion sont concentrés au nord et contre le chevet tandis que les immatures figurent pour l'essentiel à l'opposé, contre la paroi sud (fig. 7). Les os en position secondaire, présents sur toute la moitié orientale de la tombe, sont pour leur part en nombre plus important en partie sud, entre l'espace dallé recevant des adultes et le secteur à forte densité d'immatures. Le découpage interne de la moitié est de la chambre qui se révèle ainsi amène à distinguer sans ambiguïté un petit emplacement purement fonctionnel où a été accumulé une bonne partie des os déplacés. La répartition topographique par maturation ne trouve quant à elle pas de comparaison parmi les sépultures provençales étudiées. Le petit secteur au sud a accueilli les restes des plus jeunes sujets placés dans la sépulture au cours de cette phase d'occupation et, bien qu'il n'apparaisse pas matérialisé par une limite franche, il est demeuré présent tout au long des deux premières séquences d'utilisation. Il semble légitime de s'interroger sur l'aspect purement fonctionnel d'un tel espace. Celui-ci pourrait en effet répondre à la volonté de préserver les restes les plus fragiles, à l'instar des jeunes défunts placés à côté ou au-dessus des adultes dans certaines sépultures de catastrophe contemporaines (Rigeade 2006: 156). Il ne peut être exclu cependant, dans un contexte, où les nourrissons n'ont pas accès à la sépulture, que la classe d'âge concernée — entre 5 et 10-12 ans — jouisse d'un statut particulier, mais le nombre de sujets en question reste si faible que l'on ne peut accorder une quelconque valeur statistique à un tel constat. 47La même question peut être posée à propos de la petite aire dallée aménagée contre le chevet. Il s'agit du seul endroit en effet qui, lors de la première séquence d'occupation, a clairement été dégagé des restes d'au moins un sujet antérieur pour y installer un nouveau défunt. Ce renouvellement, auquel s'ajoutent le soin apporté au dallage mis en place à cet endroit et le fait que les os déplacés apparaissent pour une large part regroupés en limite de cette aire, invite à considérer qu'il s'agit d'un lieu privilégié de la sépulture tout au long de la première séquence d'utilisation. 48Il apparaît également que la topographie interne qu'il nous est donné de restituer au travers de la répartition des vestiges de la première séquence d'utilisation subsiste de manière atténuée au cours de la séquence suivante. La concentration des vestiges en moitié est, l'augmentation du volume de la petite zone de réduction ainsi que le dépôt d'un nouvel immature dans le petit secteur sud précédemment localisé reproduisent de manière amoindrie les caractéristiques de la répartition initiale. Des éléments participant de ce découpage ayant disparu dans l'intervalle, il paraît intéressant de vérifier s'il s'agit du signal d'une perte progressive du sens attaché à ces espaces ou du résultat d'un démantèlement plus poussé des squelettes. Partant du constat que notre lecture de la disposition des vestiges de la première séquence a été favorisée par des apports sédimentaires fossilisant des ensembles anatomiques avant leur démantèlement complet, il semble évident que l'espacement de ces apports, dans une dynamique où le démantèlement des cadavres semble toujours de mise, conduit à l'amoindrissement du signal topographique. De fait, celui-ci n'apparaît plus au final, en séquence 3, que sous la forme d'une grossière bipartition de la densité d'ossements où il est impossible de retrouver les subdivisions initiales. 49Concernant la troisième phase d'occupation, alors que, précédemment, la répartition des vestiges suggérait une topographie associée à des processus relativement complexes, les éléments relevés dans la seconde séquence se rapportent manifestement à un seul geste : celui de débarrasser un espace central des ossements et matériaux qui l'encombrent. La concentration des éléments déplacés en un cordon périphérique laisse peu de doute sur l'intentionnalité du geste en question. De même, l'une des finalités possibles de cette action paraît assez claire si l'on considère que la quasi-totalité des crânes se rapportant à cette phase a été placée à cet endroit. La réunion ou l'accumulation de restes crâniens n'est pas rare dans les sépultures provençales comme, par exemple, les Boileau (Devriendt et al. op. cit. ), Roaix (Sauzade 1983), la Madeleine (Sauzade & Duday 1976). La finalité de tels amas peut être simplement physique — gérer un reste encombrant et instable — comme culturelle, le prélèvement ou l'introduction de crânes en étant les signaux les plus évidents. Dans le cas présent, les défunts mis en place dans la sépulture au cours de cette phase étant très dégradés et leurs restes ayant fait l'objet d'importantes ponctions, notamment au niveau des os longs les plus volumineux, l'absence de déficit ou d'excès significatifs de blocs cranio-faciaux ne permet pas de détecter de quelconques gestes d'introduction ou prélèvement spécifiques. En revanche, le fait que la majorité de ces crânes réside au centre de la sépulture, indique clairement que cet espace leur a été réservé. L'aire en question étant relativement vaste, un tiers de la surface du caveau, cette réserve centrale ne paraît pas devoir être motivée par le seul besoin de s'accommoder au mieux des restes encombrants, ceux-ci auraient alors été entassés contre une paroi, comme c'est souvent le cas. Il est donc justifié à notre avis de retenir pour cet espace central l'hypothèse d'un lieu de dépôt privilégié associé à une pratique particulière. 50Il a été tenté, essentiellement au travers de la disposition des vestiges anthropologiques, d'approcher une topographie interne de la chambre funéraire aux différents stades de son occupation. L'exercice a été favorisé par des apports réguliers de sédiment fossilisant les restes humains dans des états intermédiaires de démantèlement. Cette sédimentation a dans quelques cas arrêté un processus funéraire conduisant au démantèlement inexorable des squelettes, comme en témoigne, entre autres, en phase 2, l'appauvrissement progressif des indicateurs d'une distribution interne spécifique au fur et à mesure de l'exhaussement du sol. De ce fait, les arguments archéologiques expriment avant tout l'attraction de la masse composée par les vestiges en position secondaire — ici 90% des objets coordonnés — qui impose à notre lecture des faits les seuls gestes de déplacer et amasser. Néanmoins, les quelques témoignages échappant à ces mouvements centripètes qu'il nous a été possible de collecter viennent confirmer que la chambre ne constitue pas seulement un digesteur de cadavres ; son approche par les Néolithiques revêt une dimension culturelle, voire symbolique, perçue dans quelques cas déjà, comme dans les exemples fondateurs des Mournouards (Leroy-Gourhan et al. 1962) et de la Chaussée-Tirancourt (op. cit.). 51Si l'on en revient à la distinction entre fonctionnel et culturel que nous avons tenté d'opérer, il apparaît, dans le dolmen de l'Ubac, que les deux composantes sont distinctement perçues à différents moments de l'occupation mais qu'elles ne sont jamais exclusives l'une de l'autre. C'est ainsi qu'il peut être très grossièrement retenu que la gestion des restes humains au cours de la première phase répond avant tout à une rationalisation de l'espace séparant les corps nouvellement déposés des restes accumulés. Mais que cet aspect fonctionnel ne justifie pas la permanence d'une petite réserve vide d'ossements près du chevet ou encore le prélèvement quasi-systématique des crânes. De même, en phase 2, alors que le mode de gestion des restes osseux aurait été favorable à l'occupation de tout l'espace, la concentration des défunts et des os en position secondaire dans un volume réduit à la moitié est du caveau conduit à envisager d'autres intentions. Mais la dimension culturelle que l'on peut alors envisager demeure très difficile à discuter avec les seuls arguments à notre disposition, même dans les cas les plus favorables, comme en phase trois où un espace dégagé au centre de la tombe semble avoir comme seul but d'accueillir des crânes. On retiendra cependant que, dans aucune des trois phases d'occupation envisagées ici, la seule rationalisation des gestes et de l'espace ne s'impose par conséquent comme l'unique mobile des différentes répartitions que nous avons pu observer. 52De fait, les arguments que nous avons présentés suggèrent que les utilisateurs successifs de cette sépulture avaient la conscience, ou la perception, d'une véritable topographie interne de la chambre funéraire répondant à plusieurs finalités. L'une des preuves de cette dimension culturelle réside dans les modifications substantielles relevées dans la gestion des restes humains et la répartition des défunts de chacune des phases. Respectées sur la longue durée, généralement tout au long de chacune des grandes périodes d'occupation distinguées, les attributions données à chaque espace n'étaient pourtant pas matérialisées de façon pérenne. La transmission au fil des générations de cette topographie interne témoigne à notre avis d'une dimension culturelle non négligeable dans l'approche et la pratique de la chambre funéraire par ses utilisateurs successifs. Billard et al. 2010, BILLARD C., GUILLON M., VERRON G. Eds., Les sépultures collectives du Néolithique récent-final de Val-de-Reuil et Porte Joie (Eure), Liège, Université - Service de Préhistoire, 2010, 409 p. (Etudes et Recherches archéologiques de l'Université de Liège (ERAUL) ; 123). Bizot et al. 2004, BIZOT B., MICHEL J., SAUZADE G., Dépôts funéraires et sédimentation dans le dolmen de l'Ubac à Goult, in: Vaucluse préhistorique : le territoire, les hommes, les cultures et les sites, Buisson-Catil J., Guilcher A., Hussy C. et al. (Dir. ), Le Pontet, Barthélémy, 2004, p. 238-244 (Ministère de la Culture et de la Communication / Direction régionale des Affaires culturelles de Provence-Alpes-Côte d'Azur). Boulestin 1998, BOULESTIN B., Approche taphonomique des restes humains : le cas des Mésolithiques de la grotte des Perrats (Agris, Charente), Université Bordeaux 1, 1998, Thèse de Doctorat, 2 vol. Bouville 1971, BOUVILLE C.P., Les restes humains du dolmen des Peyraoutes (Roquefort les Pins, Alpes-maritimes) : contribution à l'étude des populations du Néolithique et de l'Age du Bronze en Basse Provence, Marseille, Université de Provence - Centre Saint-Charles, 1971, 130 p., 5 pl. h.-t. (Travaux du laboratoire de Géologie historique et de Paléontologie ; 2). Bouville 1979, BOUVILLE C.P., Les restes humains du dolmen n° 2 du Prignon, Bulletin archéologique de Provence, Vitrolles, 4, 1979, p. 35-55. Bronk Ramsey 2009, BRONK RAMSEY C., Bayesian Analysis of Radiocarbon Dates, Radiocarbon, Yale, 51, 1 "Celebrating 50 years of radiocarbon", 2009, p. 337-360. Chambon 2003, CHAMBON P., Les morts dans les sépultures collectives néolithiques en France : du cadavre aux restes ultimes, Paris, Editions du CNRS, 2003, 395 p. (Gallia Préhistoire – Supplément ; 35). Chambon 2008, CHAMBON P., Les rangements dans les sépultures collectives néolithiques, une utopie archéologique ?, in: Archéologies de Provence et d'ailleurs : mélanges offerts à Gaëtan Congès et Gérard Sauzade, Brochier J. É., Guilcher A., Pagni M. (Dir. ), Aix-en-Provence, Association Provence Archéologie, 2008, p. 87-94 (Bulletin archéologique de Provence – Supplément ; 5). Clop García 2004, CLOP GARCÍA X., Pratiques funéraires au nord-est de la Péninsule Ibérique entre 3100- 1500 avant J.-C., in: Graves and funerary rituals during the Late Neolithic and Early Bronze Age in Europe (2700-2000 BC): proceedings of the International Conference held at the Cantonal Archaeological Museum, Sion (Switzerland) October 4th-7th 2001, Besse M., Desideri J. (Dir. ), Oxford, Archaeopress, 2004, p. 29-40 (British archaeological Reports - International Series; 1284). Courtin 1974, COURTIN J., Le Néolithique de la Provence, Paris, Société préhistorique française, 1974, 360 p. (Mémoire ; 11). Devriendt 2004, DEVRIENDT W., Les hypogées vauclusiens : vers une meilleure connaissance de la population du Néolithique final, in: Vaucluse préhistorique : le territoire, les hommes, les cultures et les sites, Buisson-Catil J., Guilcher A., Hussy C. et al. (Dir. ), Le Pontet, Barthélémy, 2004, p. 245-250 (Ministère de la Culture et de la Communication / Direction régionale des Affaires culturelles de Provence-Alpes-Côte d'Azur). Duday 2006, DUDAY H., Lezioni di archeotanatologia, archeologia funeraria e antropologia di campo, Roma, Soprintendenza Archeologica di Roma / Ecole française de Rome / EPHE, 2006, 230 p.
Hasler et al. 2002, HASLER A., COLLET H., DURAND C., CHEVILLOT P., RENAULT S., RICHIER A., Fiche n° 22 - Ventabren - Château Blanc. Une nécropole tumulaire néolithique, in: Archéologie du TGV Méditerranée : fiches de synthèse - Tome 1 - La préhistoire, Lattes, Association pour la recherche archéologique en Languedoc oriental, 2002, p. 227-238 (Monographies d'Archéologie méditerranéenne ; 8). Leclerc & Masset 2006, LECLERC J., MASSET C., L'évolution de la pratique funéraire dans la sépulture collective néolithique de La Chaussée-Tirancourt (Somme), Bulletin de la Société préhistorique Française, Paris, 103, 1, 2006, p. 87-116. Leroi-Gourhan et al. 1962, LEROI-GOURHAN A., BAILLOUD G., BRÉZILLON M., L'hypogée II des Mournouards (Mesnil-sur-Oger, Marne), Gallia Préhistoire, Paris, 5, 1, 1962, p. 23-133. Michel 2008, MICHEL J., Le dolmen de Villevieille à Demandolx (Alpes-de-Haute-Provence) : gestion d’une sépulture collective néolithique, in: Archéologies de Provence et d'ailleurs : mélanges offerts à Gaëtan Congès et Gérard Sauzade, Brochier J.É., Guilcher A., Pagni M. (Dir. ), Aix-en-Provence, Association Provence Archéologie, 2008, p. 187-204 (Bulletin archéologique de Provence – Supplément ; 5). Rigeade 2006, RIGEADE C., Les sépultures de catastrophe : approche anthropologique des sites d'inhumation en relation avec les épidémies de peste, des massacres de populations et des charniers militaires, Université de la Méditerranée / Université de Turin, 2006, Thèse de Doctorat, 236 p.
Roudil & Bérard 1981, ROUDIL O., BÉRARD G., Les Sépultures mégalithiques du Var, Marseille / Paris, Centre régional de Publications / Centre national de la Recherche scientifique, 1981, 222 p.
Sauzade 1983, SAUZADE G., Les Sépultures du Vaucluse, du Néolithique à l'Age du Bronze, Paris, Laboratoire de Paléontologie humaine et de Préhistoire - Institut de Paléontologie humaine, 1983a, 251 p. (Etudes quaternaires ; 6). Sauzade 1989, SAUZADE G., Le dolmen de Gauttobry : commune de la Londe-les-Maures (Var), Bulletin archéologique de Provence, Vitrolles, 18, 1989, p. 17-27. Sauzade et al. 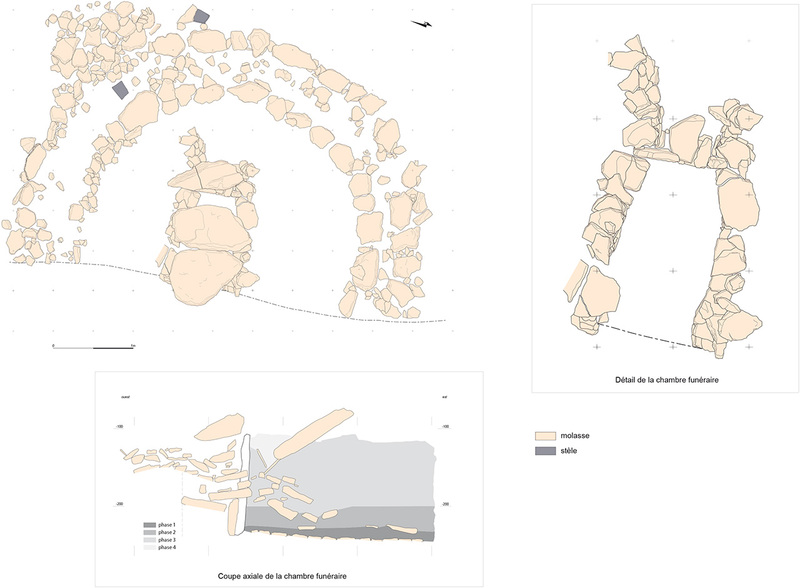 2003, SAUZADE G., BUISSON-CATIL J., BIZOT B., Le dolmen de l'Ubac et son environnement immédiat (Goult, Vaucluse), in: Temps et espaces culturels : du 6ème au 2ème millénaire en France du Sud, Gascó J., Gutherz X., Labriffe (De) P.-A. (Dir. ), Lattes, A.D.A.L., 2003, p. 335-346 (Monographies d'Archéologie méditerranéenne ; 15 / Rencontres méridionales de Préhistoire récente ; 4). Sauzade & Duday 1976, SAUZADE G., DUDAY H., L'abri de la Madeleine (Bédoin, Vaucluse), Bulletin du Musée d'Anthropologie préhistorique de Monaco, Monaco, 20, 1976, p. 97-123. Sauzade & Duday 1984, SAUZADE G., DUDAY H., L'Abri de Sanguinouse, tombe collective du Chalcolithique ancien (commune de la Roque-sur-Pernes, Vaucluse), in: Congrès préhistorique de France. Compte Rendu de la 21ème session, Montauban-Cahors 1979, Paris, Société préhistorique française, 1984, p. 280-297.